Lensed 2 rolls of 6×6 and 4 rolls of 35mm Ilford FP5,this week. Some video and digital images on my Canon 7D. I like the 6×6 square format for certain shots. Square format is balanced height to width and I don’t need to think if it will be framed better horizontal or vertical, sometimes thinking is not good “it hurts too much” 6X6 is a bigger negative, however, that technical aspect is not the reason I use it, it’s mainly for the square boxy format. In some images I find it more aesthetically pleasing, a square is nicely balanced. I also use the 35mm for aesthetic reasons. I enjoy what I term ‘dirty photography’ where the image is grainy, out of focus, contains processing imperfections, scratches, hairs, watermarks for example. I have always loved that aesthetic, it gives the image life! It also gives me the feeling of ‘photography’ especially that of old Tri-X film, which is no longer made, and with it has gone the look and feeling I got when looking at old images from the 70’s when it was a film that was used in full swing. I use Ilford HP5+ their formula has not changed, and I develop it at 80ºF and get a very close look to the old Kodak Tri-X. I really became informed by the works of Japanese photographers: Fukase Masahisa and Moriyama Dido. (I also learned, in Japan, the surname is used first) so one would not refer Masahisa as Masahisa Fukase it is correct to write the last name first, so Fukase Masahisa is correct. I bought a set of Provoke 1,2, and 3. Japanese images from the 60’s For a street aesthetic some of the best work I have ever seen. As a result of these works, I now use grain, dirt and scratches on my film as easily as I use the ‘prefect’ image, for me they are one and the same now, I do not get upset if an image is out of focus, overexposed, or grainy. I am quite the opposite, I love it, it gives me great visual pleasure and stimulation to see images like that, now I use them in my practice. Tri-x and Ilford both allow me to make mistakes and still find an image. Not the usual mistakes amateur photographer make like under or over exposure. I learned exposure from the best (Ansel Adams) and have never lost a shot due to exposure errors. However I work with cameras that have technical issues with jamming shutters, advance mechanisms, and light leaks, and the films work well under any of those conditions. I also like digital very much, I used to fight it at the beginning, but now I do things with digital that are not possible with film, like changing between color and black and white. I always shoot a RAW image coupled with a B+W Jpeg, so if I change my mind aesthetically later I have the RAW image and I can process that as color. I can also shoot video if needs be and also change the ISO at the flick of a button. I have switched back and forth a lot, so I appreciate digital from that standpoint. I always work with about 5 cameras out in the field. Each one is used specifically for the image I wish to make, I used to have just my film camera or my digital, but found myself missing out on amazing images that would look better in the other format. So I just take them all in a back pack, and pick and choose as I need. Strangely enough Ansel used to work this way, he had cases of cameras and lenses when he went out. I always thought he had a screw loose, but now know the ol’ coot was right. Have what you need, when you need it. While up in Carmel-By-The-Sea, I made images of fences and others were made up at Point Lobos, where also I found some fences. On one fence, someone had left a wristwatch dangling on it. Now I have the ‘message of time’ added to the list. I also found a board with the word ‘repent’ on it up on the way to Carmel, so that was the end of last week. The wristwatch I found this week Monday at Point Lobos. Have been printing quite a few images of the fences, and have been exposing them out to the elements: rain, wind, sunshine, dew, and fog. and have been getting some very satisfying results. Spent the week scanning,cataloging and experimenting with them in Adobe Literoom. Research: Read on an artist by the name of Brigette Bloom. She soaks her film in her own urine. This came about after she left some film in her jeans, to discover it later after they went through the wash. It was interesting because she discovered that the film was damaged, but in an interesting way. I found a parallel I’m my work with what she was doing. Bloom is doing it to the negative, I am doing it to the print. (my Ansel training is kicking in here, to really work the print side.) As I get braver, I will move to the negative and leave it out to the elements to see what will happens. (Heat: this coming summer may be the way to go, I know that heat damage can change the color of the images, and this may be a way to expand on the process. ) I am very surprised by the way the print is marked by the elements. Bloom’s idea is: ‘To mark her work work as her own. Dog on a water hydrant style.’ I feel the same way, however it is to make my mark as an artist among so many others. 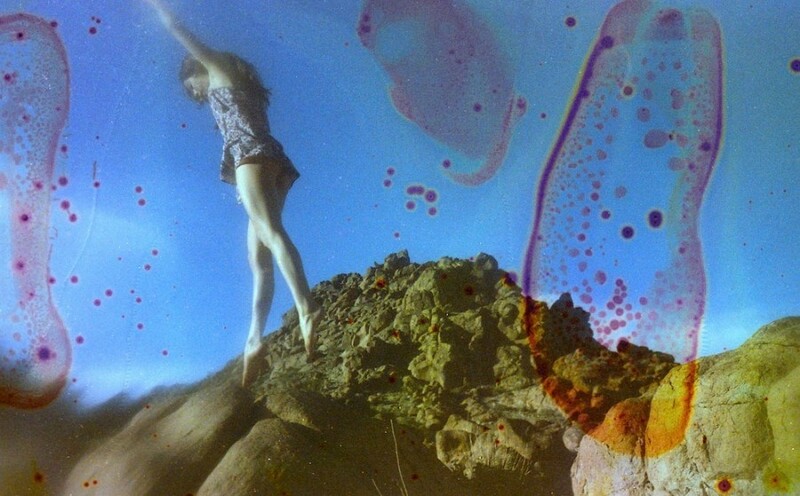 Artist: Brigette Bloom.A Photographer Soaked Her Film In Urine And We Can’t Believe How Good It Looks Photo credit: Huffington Post. When I look at her subject matter, I see a girl prancing around on the rocks. A mixture of blur and static image. One foot on the ground, the other floating on air, the color is shifted on the rocks to a greenish hue. The image is covered with round magenta forms and line. I like the contrast in the size of the round forms: from small to big, she plays well with size contrast here. The line form works well with the rocks and may well be ‘woman made’ rocks in the shape of magenta forms. 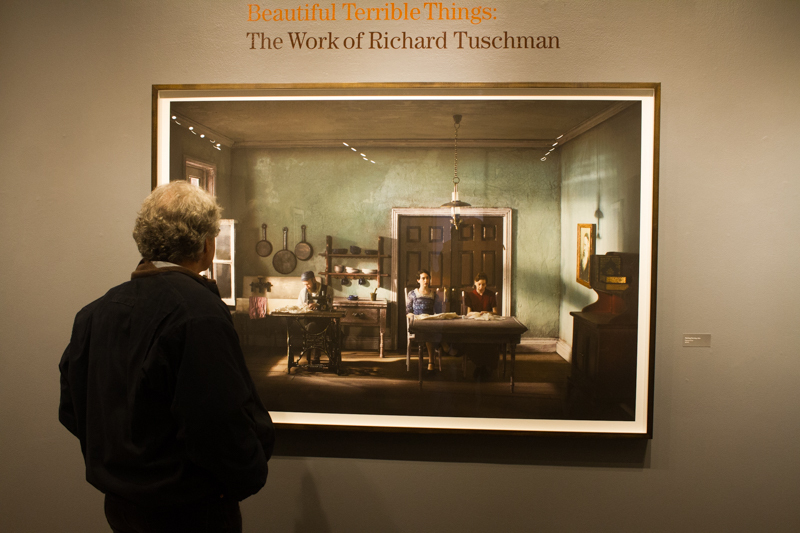 I had the opportunity to meet Richard Tuschman up in Carmel last week. Richard Gadd (curator for the Weston Gallery) invited me to a talk he was having at the Centre for Photographic Arts (CfPA) Then Richard Gadd took me over to the opening to see Richard Tuschman’s work and to meet him. I mentioned that I had a few questions about the exhibition, he asked for my card and offered to call me. Spoke about his personal life a little and how it tied into his work. (nice context about the artist and his work) made him human. Gaze of a Gaze of a Gaze ©Pierre Chemaly. Photo: courtesy of Richard Tuschman and Center for Photographic Arts, Carmel. 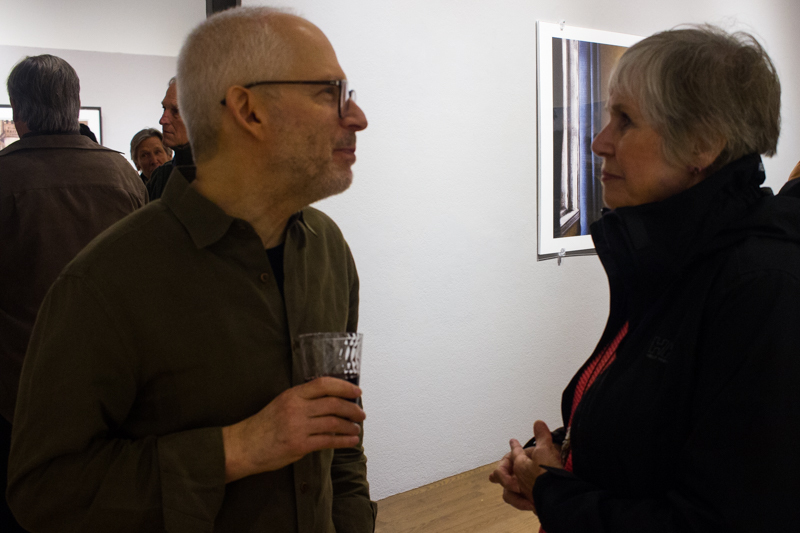 I went to the opening, bought a catalogue, had it signed by the artist, took note of the Curator, what was written about Richard Tuschman, as well as who made the exhibition possible. I have just got off the phone with Richard, he called me as he said he would and I had my list of questions about his show, I figured I would ask him how he got it to happen and how it was financed, because I need this information for my FMP, here is what I learned. The catalogue was written by the curator. He did contact Richard to ask him questions about his work. Richard did edit the writeup. Some of the costs were picked up by the gallery: print transportation, accommodation, travel and other minor expenses. 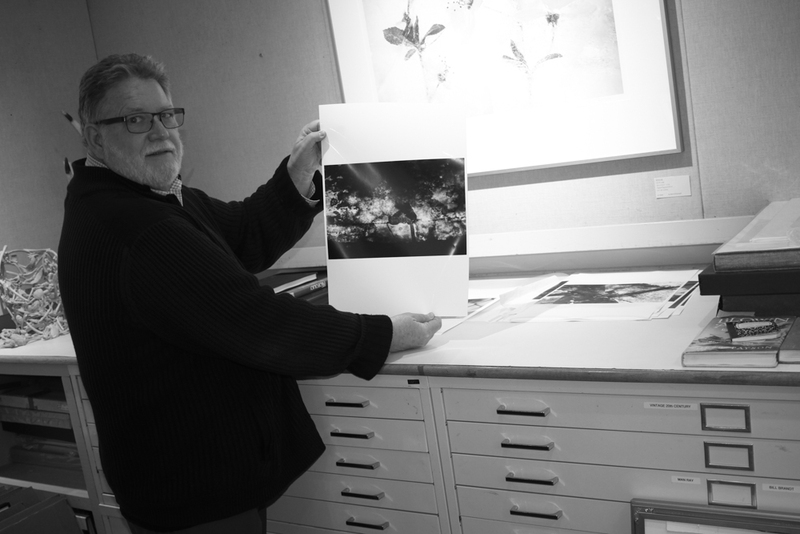 Richard already had the prints and frames form other exhibitions, which he paid for. Part of the exhibition was covered by two named patrons. I did ask Richard for advice on getting a show. He suggested that I contact the Los Angeles Center for Photography, they would be able to point me in the right direction about getting an exhibition. He also mentioned that I would have to pay all costs, as I do not have a track record and basically, would have to rent a space. I asked him how he got the exhibition up in Carmel? He mentioned he had a group show up there a few years back, and the curator invited him to have a solo show because he liked the work, and also figured that it would sell. He told me that’s a big part of the equation. 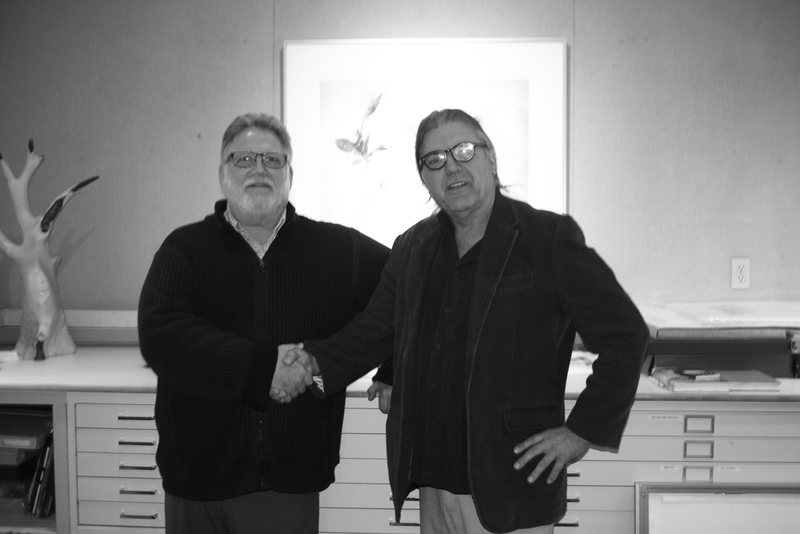 Went up to the Weston Gallery in Carmel this past Saturday, and met with Richard Gadd the curator. I wanted to have him take a look at my portfolio and get some feedback. To get informed about the work from an outside professional. He gave me almost two hours of this time. I showed him my series on Fences, and explained what I was attempting to convey with the series. He liked the work and suggested that I complete the series in the abstract. I was quite surprised! 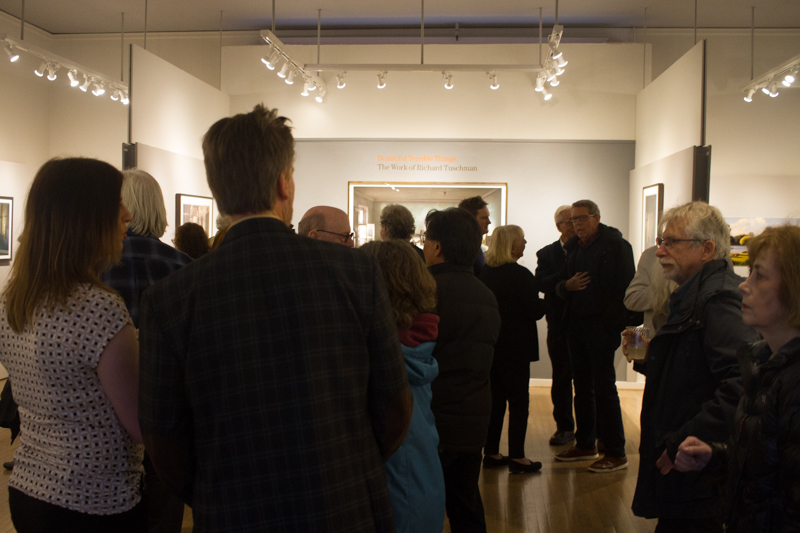 The Weston Gallery is a very conservative, with a lot of the works by Ansel Adams, Ed Weston, as well as other photographers of that era, Harry Callahan, Minor White and many others. I went up ‘informed’ I know the history of the Gallery. The works of almost all the photographers they represent. I learned about the curators creative history. I discovered that the owner of the Gallery lived in South Africa. Overall, a very enjoyable, informative, creative experience. Richard gave me a real boost about my work. Let’s see where it leads . 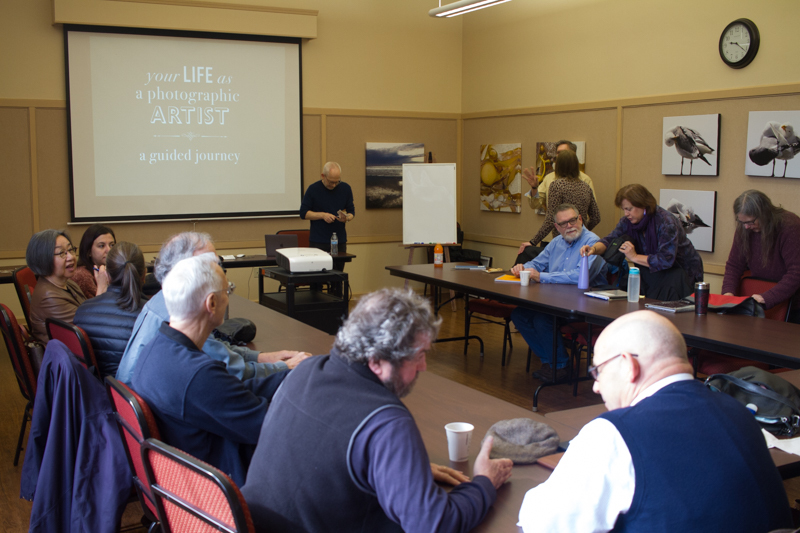 . .
Posted on March 14, 2019 March 17, 2019 Author pierre chemalyCategories Informing Contexts, Project DevelopmentTags Brigette Bloom, Huffington Post, Weston Gallery Carmel.